The members of the Literary Institute had always been keen to spread education in the town, and by 1870 measures to be taken in support of a free library, should it come about, were written into their constitution. There were 600 members by the 1920's which shows the clear demand for reading. 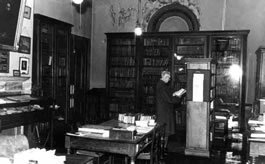 Saffron Walden got a free library in 1930 when the County library was set up in the Institute's rooms, with volunteers from the Insitute providing staffing. After the war the County library gained its own premises and need for a private Institute declined. By the 1960's the library was in financial difficulties. The County Council was invited to become the Trustee of the collection to prevent it from being broken up. 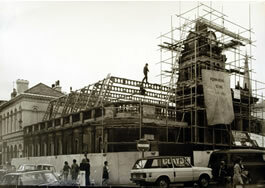 In 1972 the County Library were given the Corn Exchange building for use as a library and arts centre. In 1975 the County Library expanded into the whole of the Corn Exchange, leaving the top floor of 2 King Street for the sole use of the Town Library.